1.In small saucepan, stir sugar and water; heat just to boiling over high heat. Reduce heat to medium-low; simmer 3 minutes or until clear, do not stir. Add tea bags; cover and let steep 15 minutes. Remove and discard tea bags; cool. Transfer chamomile syrup to glass container; cover and refrigerate up to 2 weeks. 2.Fill cocktail shaker with ice; add bourbon, lemon juice, apricot liqueur, bitters and 1-1/2 tablespoons chamomile syrup. Shake and strain into 12-ounce glass with 1 large ice cube. 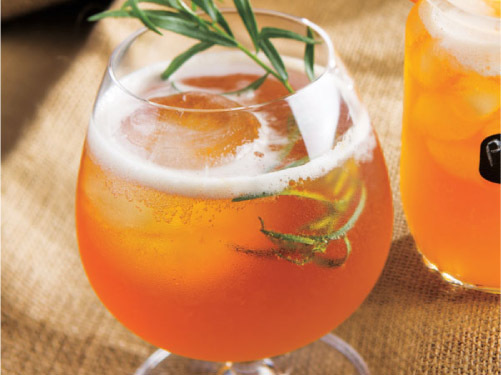 Top with pale ale; stir gently and garnish with tarragon sprig, if desired.